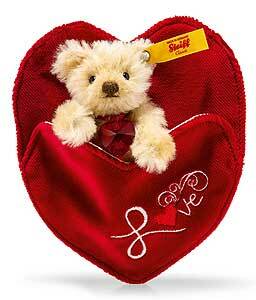 Classic Steiff Mini Teddy Bear Lovely, made in beautiful cream mohair and features "Love" embroidered on the heart shaped pouch. The Little Teddy is held in the pouch, (for safe keeping), by 2 knotted stitches through back of pouch. These can be removed, carefully, to remove this cute little bear, if required. This wonderful Teddy Bear is from the Steiff Classic miniatures range and he wears the famous Steiff Button in Ear along with the yellow tag.